Neapolitan Mastiffs, like all European Mastiffs, are derived from Middle Eastern wolves. This evolution likely took several hundred years, and likely involved cross-breeding with other Italian dogs over the centuries. 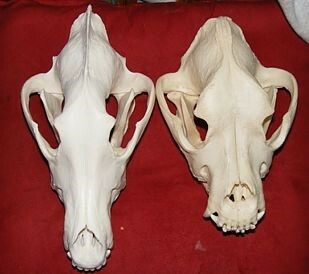 On the surface, it would appear that the Roman gladiator dog would have the same skull and power as a wolf that has to fight moose on a regular basis, the reality is that Neapolitan Mastiffs have not evolved anything like a wolf's skull. A northern wolf evolved to live in a much more intense environment than Rome 's gladiatorial circuses. And there is not a lot of good evidence that suggests that the Neopolitian mastiff is actually the same strain that the Romans used. The type may be old, but the strain most likely has very different genetics now. We do know that much of the Neapolitan Mastiff's features have been exaggerated since it became a show dog, but the wolf can vary only so much in head structure before it becomes unable to take down a moose effectively. 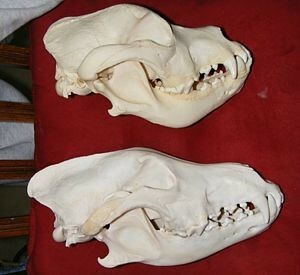 So although it appears that Neapolitan Mastiffs might be closer to wolves in their fighting abilities and phenotype, the two animals are now quite different. The Neapolitan Mastiff is an estate guard dog from Italy. 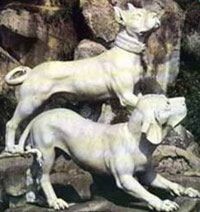 The breed traces its roots to the dogs of war used by the Roman Army. The breed then existed on estates and farms across Italy for the past two millennia, known as the "big dog of the little man" -- the extraordinary dog of the ordinary man. 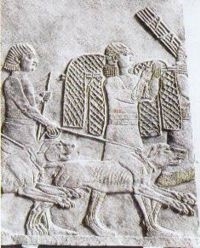 While the Neapolitan Mastiff has been recognised as a breed in the modern world only since recognition by the FCI in 1949, we can see, through bas-relief, paintings and statues dating from 3000 years before Christ, that his recorded roots trace to the giant war dogs of Egypt, Persia, Mesopotamia and Asia. Even as grand a figure as Alexander the Great (356-323 BC) was instrumental in creating the modern Neapolitan Mastiff. 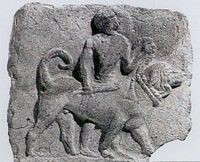 Alexander is known to have crossed the giant Macedonian and Epirian war dogs with the short-haired "Indian" dogs to create the Molossus. The Molossus was a dog characterised by having a wide, short muzzle, and a heavy dewlap, and was used along with Roman gladiators to fight tigers, lions, elephants, and men in battle. This animal is easily recognised as the great forefather of the Neapolitan Mastiff. 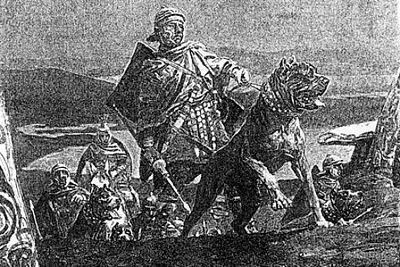 When the Romans conquered Greece, they adopted the Molossus dogs and also used them in battle, in the hunt and in the arena. The breed is reported to have been used to fight alongside the Roman Legions, by having bladed and spiked leather harnesses tied to their backs and being trained to run under the bellies of enemy horses, to disembowel them. The Roman invasion of England gave them access to the even larger giant Mastiff dogs there, which the Romans crossed with their own now formidable war beasts. The several different breeds that are descended from these dogs originating in many different European countries, have many traits in common: they are large powerful animals, are devoted to their masters, and are superior defenders of person and property. Over the centuries, breeders of the Mastino in the Neapolitan area of southern Italy focused on breeding guards for the homes and estate. They created a breed that retained the giant size, heavy, loose skin, and dewlap. This was an animal that was a stay-at-home type, and was good with the family. It was bred to detect unwanted intruders and to deter them from the property under their care. Indeed, many say that the Neapolitan Mastiff's unique type was developed purposely as an alarmingly ugly dog whose looks alone were enough to deter any intruder. After the devastation of World War II, the breed was recognised as an unquestionable treasure of Italy and consequently, has been refined to its present form over the past 60 years. A breed standard was first written in 1948, later re-written for greater precision in 1971, and the Neapolitan Mastiff has thus claimed its rightful place among the international world of dogs.